The praying mantis glared at me. It was not afraid of me, my camera, or my jockeying around to get a better position. 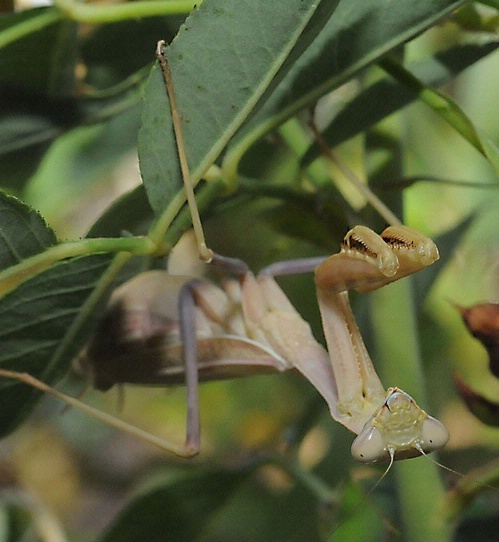 When I captured the image (below) last fall in a neighbor's garden, I decided that in 2009, I would get my very own praying mantis. Or maybe dozens of them. 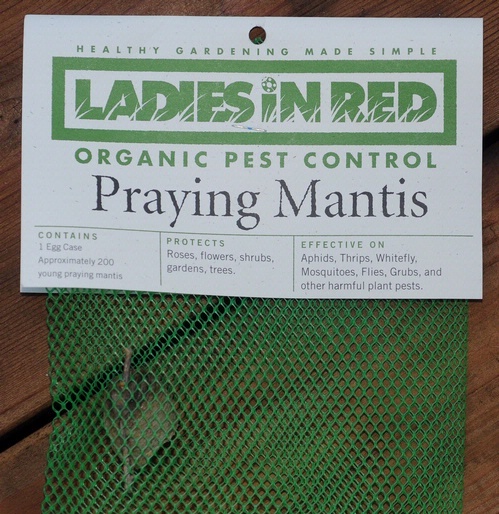 Praying mantises, you see, help control aphids, thrips, flies, whiteflies, mosquitoes, and grubs. They also make great portraits. So, how do you get your very own praying mantis? You can order egg cases online (just Google "praying mantis egg cases") or buy them at a local nursery. Also, you can usually find them in the gardening section of your favorite hardware store. You'll get a finely meshed net bag. You hang it in a tree or bush by threading a small branch through the mesh or by nailing the bag to the branch. The eggs will hatch three weeks after temperatures reach 70 degrees. The tiny mantises will exit through the holes and scatter into the nearby foliage. We purchased our bag (well, two bags) today in the gardening section of Home Depot. The egg cases are refrigerated to avoid unwanted hatching in the store. Each bag contains one egg case, and each egg case will yield about 200 mantises, the instruction indicate. 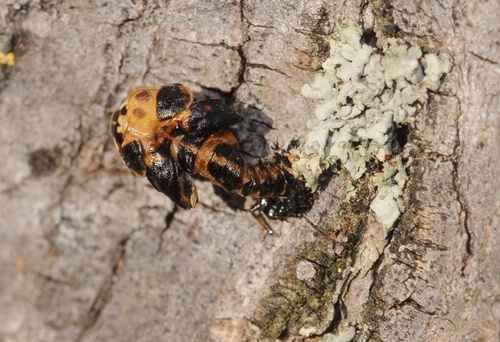 The insects will mature in 4 to 6 months. The female will deposit from one to 5 egg cases before winter. With the first freeze, the adults die. The egg cases hatch in the spring. Now, we wait. Soon, with any luck, we'll have scores of praying mantises. 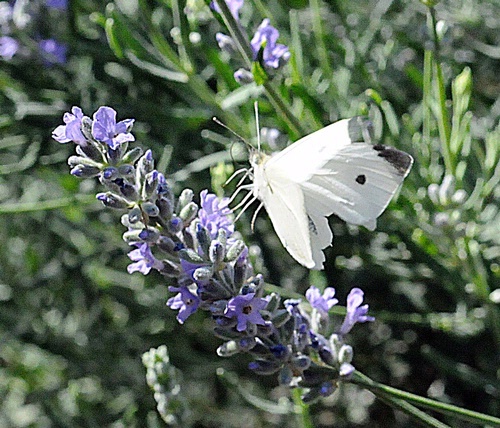 Hardly anyone can beat University of California, Davis professor Arthur Shapiro in finding the first cabbage white butterfly of the year. For the past 38 years, he's been hosting a "Beer-for-Butterfly" contest. If you're the first to find a cabbage white butterfly (from a three-county area: Yolo, Solano or Sacramento), you win a pitcher of beer. He won his own contest. For that, he wins his own pitcher of beer. Bottoms up! Shapiro immediately credited President Barack Obama for inspiring the early emergence of the cabbage white. The professor found the butterfly, a male, at 12:57 p.m. on the south-facing embankment of the Old Davis Road interchange of Interstate Highway 80, adjacent to the University of California, Davis campus. I figured he’d find it there. I spotted him walking along the embankment last week and thought "Ah, ha! There goes lepidopterist Art Shapiro searching for the first cabbage white of the year." He earlier offered this hint: Most likely the cabbage white will be in a vacant lot or by a roadside where wild mustards grow. The Pieris rapae is a white or buff-colored butterfly about 1-1/4 inches long. 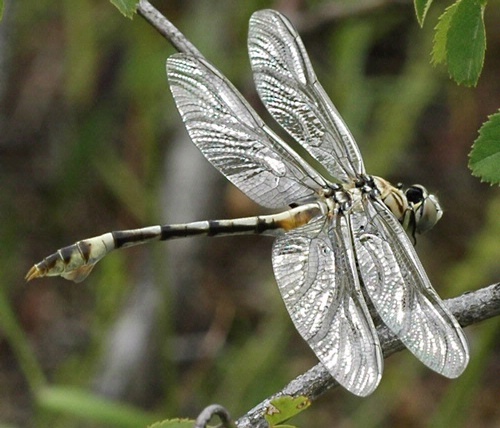 It spots a black spot or spots near its wing base. 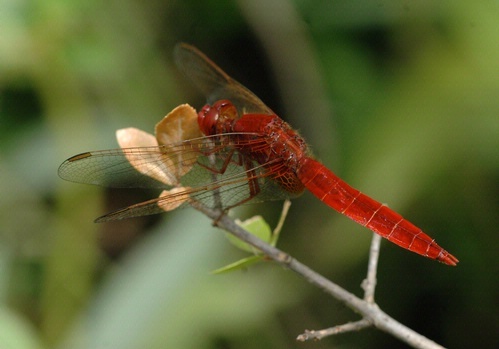 The underside of its hindwing is yellow with a grayish cast. The ladybugs are out, at least in some parts of Northern California. We received an email last week from a professional wildlife photographer from Germany who wants to film hibernating ladybugs in February. He's on a magazine assignment. 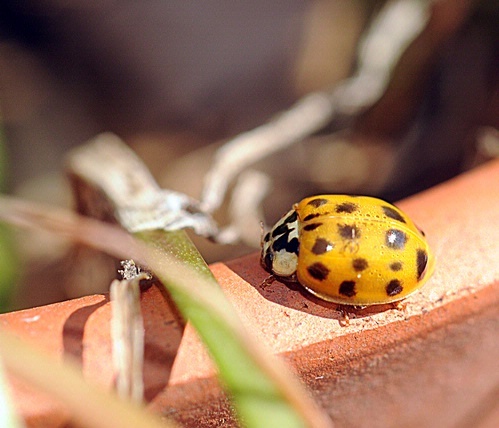 So, where are the hibernating ladybugs in the wild? Last weekend, while over in Fairfield, Calif., I captured some images of Asian ladybugs and pupae in and around a redwood tree. 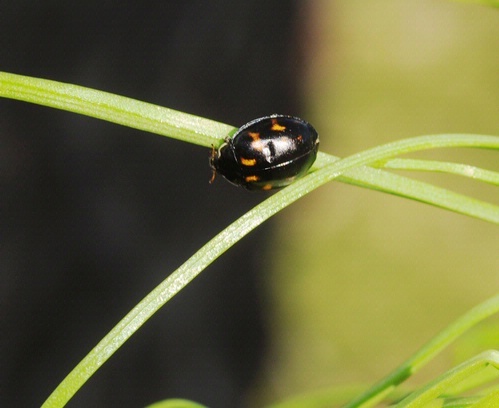 Lynn Kimsey, professor and chair of the UC Davis Department of Entomology and director of the Bohart Museum of Entomology, says that overwintering aggregations of ladybugs are almost trade secrets. "These aggregations are harvested by individuals who then sell the beetles to nurseries for the public to release in their garden," Kimsey says. "I personally don't know the location of any aggregations although we know that they occur in the mid-elevations in the foothills of the Sierra Nevada Mountains." And, of course, there's the springlike weather we're having that can break the dormancy of the ladybugs. Ladybug photographers can also purchase packages of ladybugs from commercial dealers, chill them, and "create" aggregations. Ladybugs, aka ladybird beetles from the family Coccinellidae, are wonderful residents of a garden. They eat aphids, mealybugs, mites and other soft-bodied insects. 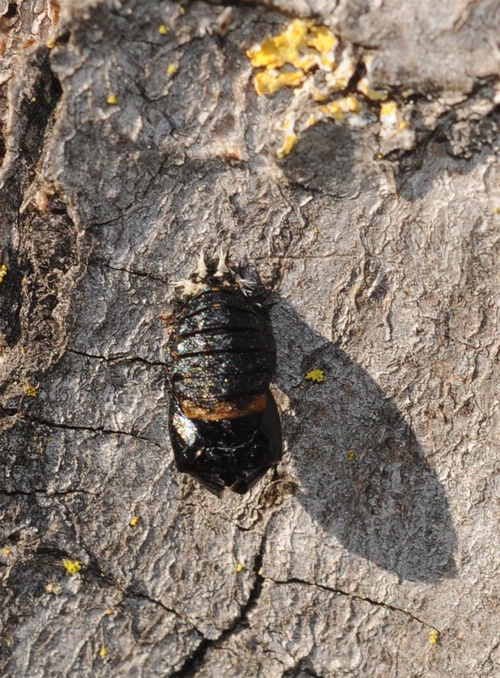 "One of the most common insects in California, this species assembles in great numbers in canyons and hills of the Coast Ranges and Sierra Nevada for hibernation," write Jerry Powell and Charles Hogue in their book, California Insects. "The beetles are often seen when the overwintering masses begin to disperse on warm days in February or March. They migrate to the valleys where they feed on aphids. Adults of the following generation return to the mountain aggregations in May or June, when the lowland vegetation is drying." Look for them in a garden near you! Call it serendipity. Call it a major collaborative effort. Call it a keen eye for science. Whatever you call it, research that sprang from studies on insect pest control in the Bruce Hammock lab at the University of California, Davis, has resulted in a prototype drug that reduces heart enlargement, one of the most common causes of heart failure. We all know of people suffering from heart failure, which occurs when the heart can’t pump enough blood throughout the body. The condition affects 5 million people in the United States and contributes to 300,000 deaths each year. The leading causes of heart failure are coronary artery disease, high blood pressure and diabetes. The research in the laboratories of cardiologist and cell biologist Nipavan Chiamvimonvat, Department of Cardiovascular Medicine, UC Davis School of Medicine, and entomologist Bruce Hammock, Department of Entomology, showed that the new class of drugs reduces heart swelling in rat models with heart failure. “This holds promise to treat heart failure and other cardiovascular as well as kidney problems,” said nephrology professor Robert Weiss, Department of Internal Medicine. Similar compounds are now in clinical trials. "The study of rat models showed that heart failure is driven by high angiotensin associated with high blood pressure, artery disease and some kidney disease,” Hammock said. “When that occurs, a key enzyme called soluble epoxide hydrolase is increased." The 11-member research team showed they could inhibit the enzyme with a drug made by Paul Jones, a former postgraduate researcher at UC Davis. The swelling and ultimate failure of the heart is blocked and reversed, Hammock said. This research follows earlier studies reported from the Chiamvimonvat laboratory on cardiac hypertrophy. 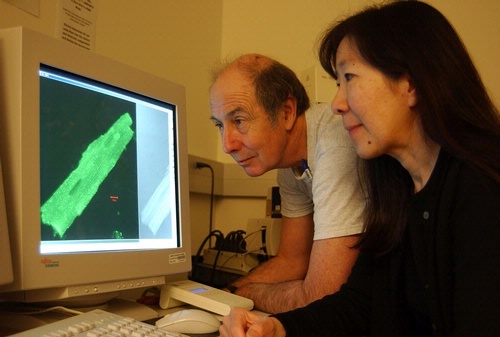 The two UC Davis laboratories collaborated with the laboratories of John Shyy at UC Riverside and Yi Zhu, Cardiovascular Sciences, Peking University Health Science Center. The paper, “Soluble Epoxide Hydrolase Plays an Essential Role in Angiotensin II-Induced Cardiac Hypertrophy,” is online. This is definitely a significant discovery that could result in saving scores of lives. And to think it all started with the Hammock lab discovering an enzyme inhibitor that regulates insect larvae development. If you like to combine art with science, here you go. In keeping with the theme, “The Consilience of Art And Science," the Pence Gallery and the UC Davis Art/Science Fusion Program are sponsoring a juried exhibition, open to all artists and scientists. The deadline to submit a CD and entry information is Feb. 20. The Pence Gallery, located at 212 D St., Davis, will exhibit the selected work March 10-April 12. The Consilience of Art and Science is a centennial colloquium sponsored by the UC Davis Art/Science Fusion experimental learning program. The goals of the Pence Gallery exhibitions are three-fold, said Art/Science Fusion co-director Diane Ullman, associate dean of Undergraduate Academic Programs, College of Agricultural and Environmental Sciences, and professor of entomology. 3. To spark new ways of viewing the world and ourselves. You can find more information--the rules and an entry form--here. For additional information, contact Natalie Nelson, director of the Pence Gallery, at (530) 758-3370 or at penceartdirector@sbcglobal.net. E. O. Wilson’s highly acclaimed book, “Consilience: The Unity of Knowledge,” helped inspire the colloquium, Ullman said. His quote, "Neither science nor the arts can be complete without combining their separate strengths," provides the "intellectual foundation" for the Art/Science Fusion Program at UC Davis, the unifying theme for the UC Davis Centennial Colloquium and the 2009 juried exhibition at the Pence Gallery. One has only to look at photographs of insects to realize that "Neither science nor the arts can be complete without combining their separate strengths." 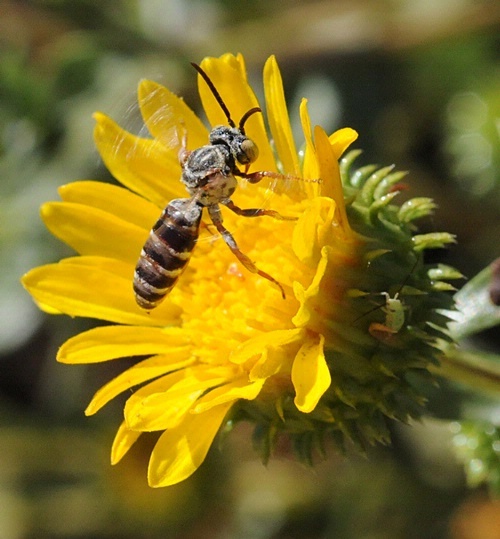 CUCKOO BEE--This photo of a cuckoo bee, taken by Kathy Keatley Garvey of the UC Davis Department of Entomology, was accepted into the international Insect Salon juried show and exhibited at the Entomological Society of America's 56th annual meeting in Reno. She titled it: "Watch Out Below!"